The Xpedition version comes with with black aluminium panniers with a total capacity of 82 liters (21.7 gallons), engine and hand guards, an aluminium sump guard and a center stand. “The V-Strom 650 is still a hugely popular model for us, so we are delighted to be able to offer a new flagship model with tough and practical additions,” says David Taylor, Suzuki GB sales and marketing director. The motorcycle is powered by a fuel-injected 645cc liquid-cooled V-twin. The V-Strom Xpedition has a price tag of £7,300 pound ($11,399), compared to the V-Strom 650 ABS’ £6399 pound ($9,992). 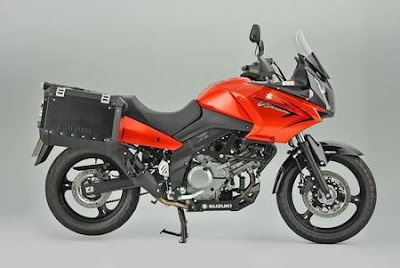 The Xpedition joins Suzuki GB’s V-Strom line which also includes the 650GT touring variant and the 650X adventure bike. The XP version comes equipped black aluminum panniers with a total capacity of 82 liters (21.7 gallons), engine and hand guards, an aluminum sump guard and a center stand. “The V-Strom 650 is still a hugely popular model for us, so we are delighted to be able to offer a new flagship model with tough and practical additions,” says David Taylor, Suzuki GB sales and marketing director. Like the V-Strom 650 ABS, the Xpedition is powered by a fuel-injected 645cc liquid-cooled 90-degree Twin engine. The windshield can be adjusted to three different heights while the tank holds 22 liters (5.8 gallons) of fuel.